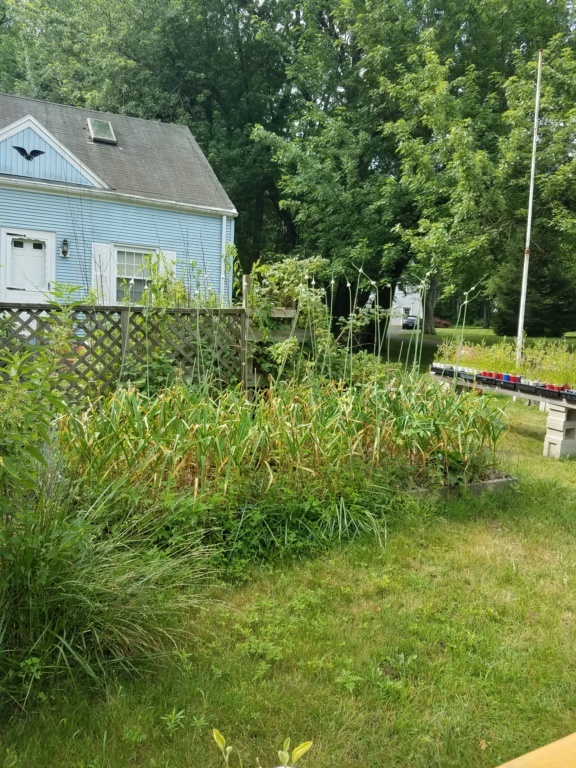 The bottom of my 2'x4' garlic bed on wheels feel out a couple weeks ago. I'm afraid that I will not be able to keep the Mel's Mix moist come the hotter and dryer months. It's only held together by the commercial weed fabric that lined the bed. 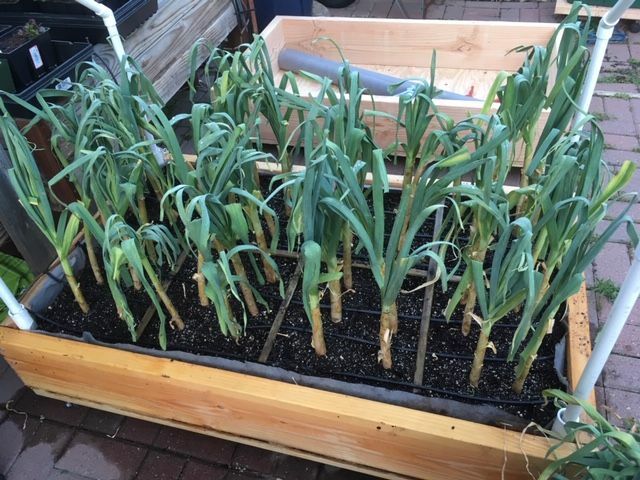 Has anyone transplanted garlic at the 1' stage successfully? Anyone? Or, maybe this is such a rare occurrence. @sanderson wrote: Anyone? Or, maybe this is such a rare occurrence. I would do it, it is so hardy that I don’t think it will bother it one bit. 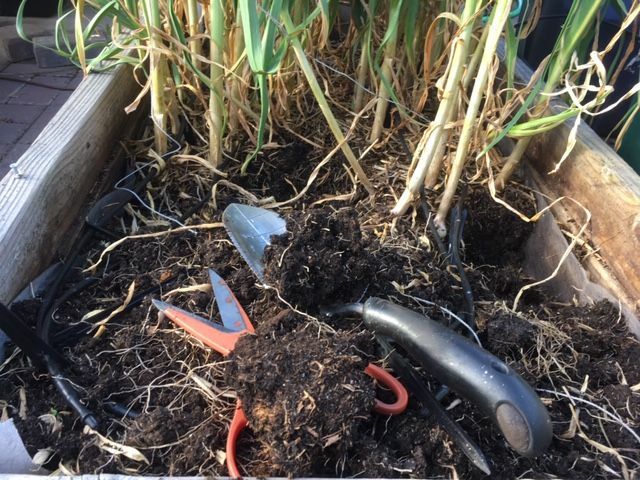 I have never had to do the mid-season transplant but I would do it late afternoon as garlic is a bulb and very sun sensitive. I would watch the roots as they should be good size by mid-season and handle with care. I would create a layer on which to place the bulbs and spread out the roots and then slowly top with 4" of mix. 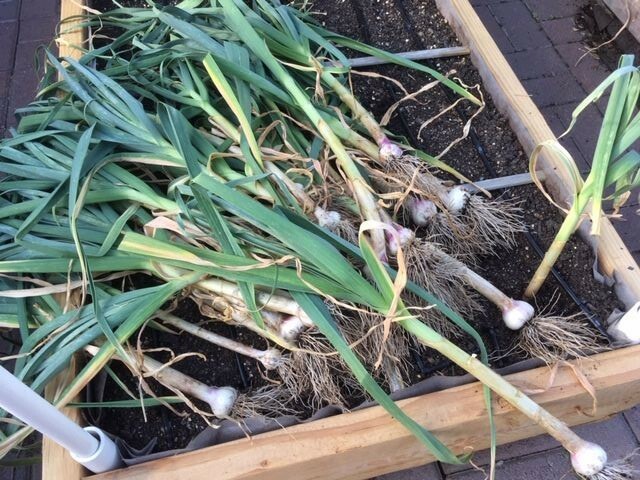 I plant my garlic 4" deep, 6" spacing to the bottom of the bulb but my raised beds are open to fairly good soil. 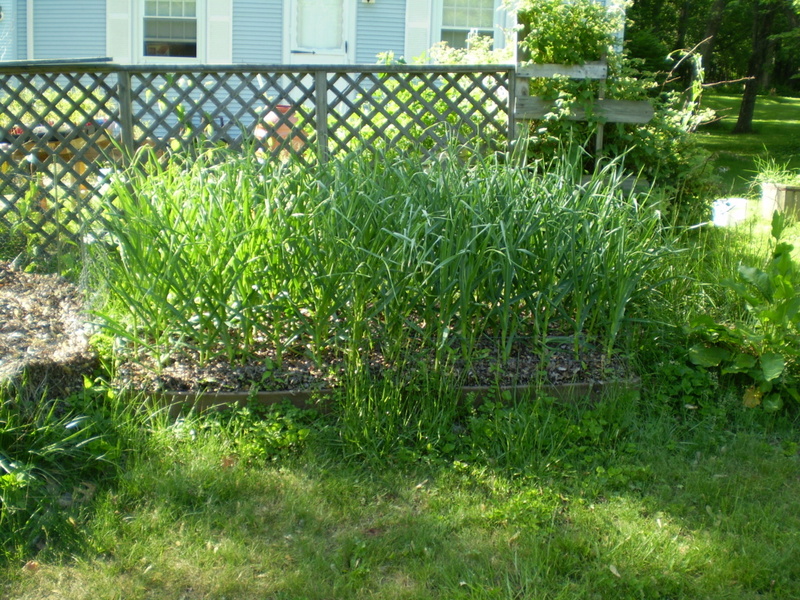 Here is a picture or two of my garlic beds, 4'x4'. These pictures are from two different years. 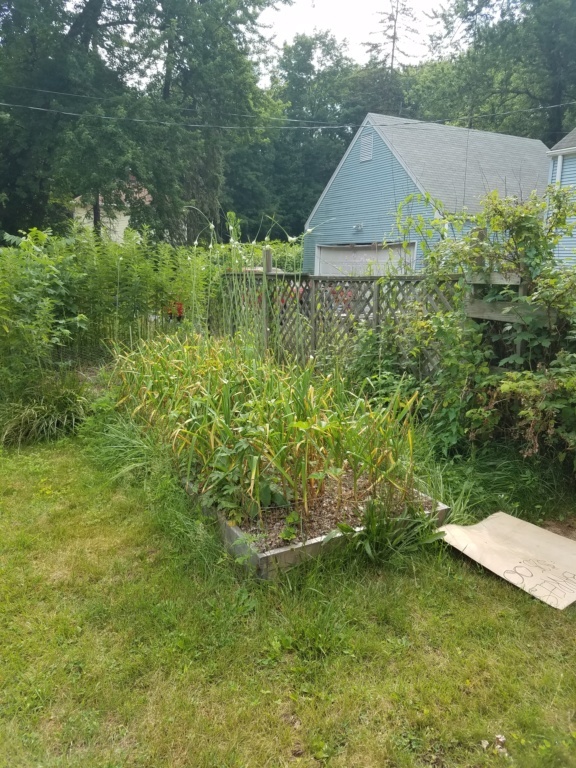 The last two pictures are just before being harvested and a third 4'x4' bed had been added. I haven't grown garlic the last two years but will be growing again this fall as my daughter would like to learn how. Thanks both. I finally decided I had nothing to lose but garlic, and nothing to gain but garlic. @sanderson wrote: Thanks both. I finally decided I had nothing to lose but garlic, and nothing to gain but garlic. I really think it will be fine. Alliums are pretty hardy! Sanderson, can you leave some so that if anything happens to the transplanted ones you'll still have a backup? Dan, what kind of garlic is that in your photos? The scapes stand straight up. Mine curl round and round. CapeCoddess, the scapes were an observational experiment that year. I let them grow to harvest to see if there was a difference, harvesting the scapes vs not harvesting the scapes making a difference in the size of the bulbs. I had read conflicting information on harvesting or leaving scapes and wondering how were different varieties of garlic developed. This and many other gardening questions will be answered in my gardening book, Growers, Showers and Liars, I Have Met in My Garden. Just kidding! The garlic I grew was German Porcelain I originally got two bulbs from Wayne Hanson and two bulbs from another vendor at The Coventry, Ct. Farmers Market. Wayne sent his wife to get two bulbs from the van, seed garlic, bigger cloves, when he found out I was trying to grow garlic. He also gave me a doubled-side printed sheet on how to grow garlic. Wayne Hanson had the first certified organic farm in Ct. I found out he is selling his farm. So next year I may have to find another source for my seed garlic but will keep the variety as I restock while showing my daughter how to grow garlic. Stores extremely well, if dried properly, over a year. I love roasted garlic on fresh Italian bread and as one of the added ingredients in my homemade humus. The other is roasted peppers both hot and sweet. Two dietary requirements in my plan on living for forever, so far so good. The answer to the scapes question, the scapes do a double loop, I harvest at or before the first loop. The double looped scapes then straighten out as they go skyward. Once you give someone fresh scapes and the recipe that they are an awesome addition to scrambled eggs you will have a phenological phenomenon, they will be back exactly the same time next year. The other answer to what I observed, if you allow the scapes to do this the cloves in the harvested bulbs are only slightly larger than the seeds found in the bulblets. You can grow out the seed but takes a few years to get bulbs with edible size cloves from what I read. The bulbs are hardly worth harvesting. I think if left alone, garlic will take on the characteristics of Egyptian Walking Onions. The scapes fall down and replant themselves. @Dan in Ct wrote: . . . Once you give someone fresh scapes and the recipe that they are an awesome addition to scrambled eggs you will have a phenological phenomenon, they will be back exactly the same time next year. . . .
That's a good one. And, probably true! I had read conflicting information on harvesting or leaving scapes and wondering how were different varieties of garlic developed. This and many other gardening questions will be answered in my gardening book, Growers, Showers and Liars, I Have Met in My Garden. Just kidding! I will definitely buy one! @sanderson wrote: I will definitely buy one! Here it is mid-April and this afternoon I removed the garlic from the collapsing bed on wheels. Some of the garlic looks good enough to eat but most is just bulbing. I had to hack, saw and pry the garlic from the bed. Something very wrong with what is supposed to be MM. I have a sweet new bed with amended, friable MM ready for them. I cut the roots to 4". I have cleaned the roots of hard stuff and trimmed them. Look at the size of these hard clumps. I had to use the hand spade with jagged teeth. Can't answer the questions but why cut the leaves? Hope you didn't let the root dry out. I covered the root half of the garlics with a wet beach towel for the night. I thought if I trimmed a little off the leaves they wouldn't be so top heavy while the roots recover. ?? Are you growing hard- or soft-neck types of garlic? My experience is 95% hardneck, and I've never had to give them haircuts. Perhaps someone will chime in with specific advice. It's CA soft neck that was planted in October. The bottom of the bed they were in fell out so I had to rescue them. The second problem was that they were bulbing early and most had 1-3 wilted leaves. So I end up trimming the leaves and roots and put them in the new 2 week old bed. It is what it is. In the background is the bed my husband made today. Dragon Tongue beans will go in it when I get the MM made.